To test the powers of the new atlas, researchers decided to use the database to explore the activity of 319 genes, previously linked to autism, during the mid-prenatal period. They discovered that many of these genes were switched on in the developing neocortex—a part of the brain that is responsible for complex behaviors and that is known to be disrupted in children with autism. Specifically, these genes were activated in newly formed excitatory neurons, which are nerve cells that send information from one part of the brain to another. The finding provides more evidence that the first seeds for autism are planted at the time when the cortex is in the midst of forming its six-layered architecture and circuitry. Another finding underscored why it is so important for women to consume enough folic acid during pregnancy. Researchers discovered that the gene for the folic acid receptor is active in the zones of the prenatal brain that give rise to the excitatory and inhibitory neurons of the cortex, which are the building blocks of neural circuitry. That may explain why a shortage of folic acid in a pregnant woman can lead to severe birth defects of the brain, spine, and spinal cord in her newborn baby. Building a gene-expression atlas of the developing human brain is a wonderful first step, but much more work lies ahead in order to unlock fully the many complex mysteries of the human brain. Just over a year ago, I was happy to join President Obama in announcing the Brain Research through Advancing Innovative Neurotechnologies (BRAIN) Initiative. By accelerating the development and application of innovative tools and technologies, BRAIN will further enable the creation of a dynamic new picture of the brain that will show how individual cells and complex neural circuits interact in both time and space. Long desired by researchers seeking new ways to treat, cure, and even prevent brain disorders, this picture will fill major gaps in our current knowledge and provide unprecedented opportunities for exploring exactly how the brain enables the human body to record, process, utilize, store, and retrieve vast quantities of information, all at the speed of thought. 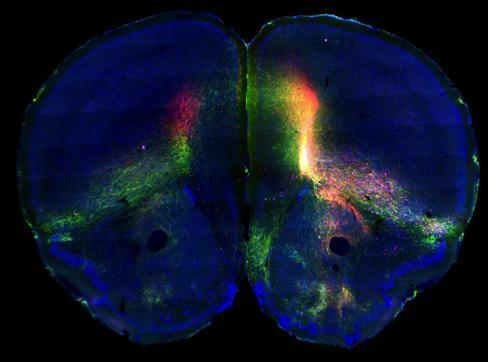 Caption: A section of a mouse brain injected with fluorescent dyes called tracers, which reveal different connections in the cortex. All tracers are atop a fluorescent blue background. In addition to making new maps of the human brain, we can learn a lot by charting the brain circuitry of laboratory animals that are commonly used to model diseases and test therapies. NIH-funded researchers, led by a team at the University of Southern California, Los Angeles, recently produced a wiring diagram of 600 pathways in the mouse’s cerebral cortex—the outermost part of the brain that lies right under the skull . In humans, the cortex plays complex roles in decision-making, memory, social behavior, and consciousness; it’s also one of the brain regions that malfunctions in diseases like Alzheimer’s, schizophrenia, autism, and depression. The wiring diagram of the mouse cortex revealed a surprisingly logical arrangement of neurons—defying the common perception that the cortex is a tangled mass of neurons with everything connected to everything. In fact, the researchers discovered the mouse cortex is organized into approximately eight distinct neural sub-networks: four control sensations and movement; two appear to integrate sight and sound, potentially providing spatial orientation; one helps to integrate sensory data from internal organs, such as hunger and pain; and one receives input from other cortical areas, suggesting it acts as a coordinating hub. While the cortex was the focus of this study, the USC researchers ultimately hope to produce a 3-D digital database of the neural connections in the whole brain of a healthy adult mouse. This “connectome map” will serve as a reference point for identifying abnormal connections in the brains of mice that serve as models of disease. 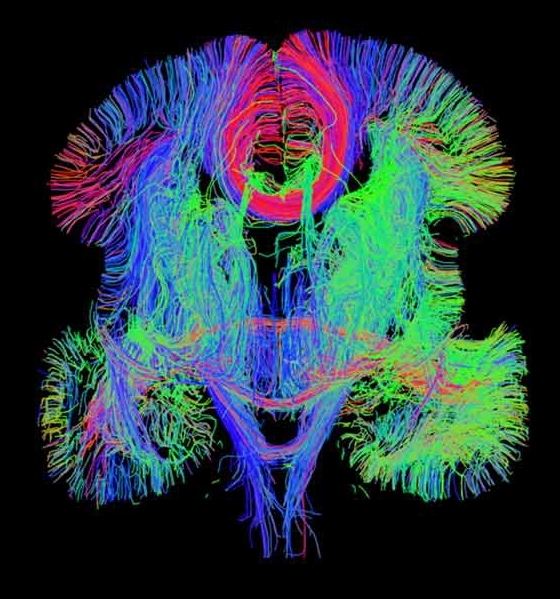 In a complementary project , researchers at the Allen Institute have just generated a 3-D map of neuronal connections in the entire mouse brain—the most comprehensive wiring diagram of a mammalian brain to date. Using a similar strategy to the USC team, albeit with different tracers and imaging systems, these researchers mapped 469 pathways crisscrossing the entire brain. Importantly, the creators of all these new brain maps—both human and mouse—have made their data freely available to the worldwide scientific community. As scientists tap into these wonderful resources—and many more yet to come from the BRAIN Initiative—we can look forward to a revolution in our understanding of what many have called biomedicine’s “final frontier”: the human brain. Transcriptional landscape of the prenatal human brain. Miller JA et al. Nature. 2014 Apr 2. Neural networks of the mouse neocortex. Zingg B, Hintiryan H, Gou L, Song MY, Bay M, Bienkowski MS, Foster NN, Yamashita S, Bowman I, Toga AW, Dong HW. Cell. 2014 Feb 27;156(5):1096-111. A mesoscale connectome of the mouse brain. Oh SW, Harris JA, Ng L, Winslow B, Cain N, Mihalas S, Wang Q, Lau C, Kuan L, Henry AM, Mortrud MT, Ouellette B, Nguyen TN, Sorensen SA, Slaughterbeck CR, Wakeman W, Li Y, Feng D, Ho A, Nicholas E, Hirokawa KE, Bohn P, Joines KM, Peng H, Hawrylycz MJ, Phillips JW, Hohmann JG, Wohnoutka P, Gerfen CR, Koch C, Bernard A, Dang C, Jones AR, Zeng H. Nature. 2014 Apr 2. I wanted to thank you for this great read!! I definitely loved every bit of it. I’ve got you book-marked to check out new things you post. Fascinating article. The brain is such a complex organ and these insights should lead to further development for understanding and treating disease. You mentioned folic acid and the role that it plays. I’m not a neuroscience major, however, I believe that the increase in diseases that we have seen in last 20 years including autism is directly linked to the decrease in food quality within the United States. We’ve got millions of kids who are extremely sick some of them suffer from autism, others are sensitive or intolerant to gluten and the list goes on. I personally blame the government and the farming industry for the lack of proper research before overrunning our food supply with genetically modified foods and using tons of other pesticides and herbicides. These things are killing us and our kids. Research probably won’t find the direct link to this for another decade or two but I’d bet all that I have that what we eat are causing these changes in the neural connections and directly affecting gene expression. I agree with you, and it is not only what we feed our children, but also what mothers consume well before pregnancy that affect brain and CNS development in the womb. Great Post. Superb!!! Got to know lots of amazing facts about brains. I agree with Jared K, Fascinating article. The notion a switch is turned on or off in the womb that causes these disorders, is mind blowing to me. I know it shouldn’t be, it makes sense. With today’s technology, I hope we’re just a few years off, rather than a decade. In any case, thanks for a great article. This is a very well informative article. I am glad that we have committed funding from NIH and responsible and passionate researchers. I hope that the continued research and available resources will yield tangible results for humans and help make this world a better place from all of us. Thanks for sharing this wonderful article. Good Images. I Like this Blog.